Enjoy your outdoor space all year around! Choose awnings for your patio, door or window to spend more time enjoying your outdoor space while staying protected from sun exposure and heat. Complete Home Improvement provides made-to-order, stylish and long-lasting awnings for residential and commercial projects. Thousands of satisfied customers across Sydney trust us for our high-quality workmanship and affordable pricing. So why wait? Get ready to entertain your family and friends in style today. Give your outdoors and indoors better protection with our stellar range of products. How about adding a new outdoor room to your home and getting the most out of the summers? With Complete Home Improvement’s beautiful range of external awnings, you can enjoy the summers in style. Awnings are a perfect outdoor extension at an affordable budget, which will add a smart change to your outdoors. Our extensive range of outdoor awnings in Sydney includes retractable awnings, fixed awnings, outdoor window awnings, and commercial awnings. Our magnificent awnings will impeccably fit into any existing outdoor architecture. Complete Home Improvement has attractive outdoor window awnings in a variety of styles to give you a practical solution for controlling harmful UV light and glare. By providing UV protection, great airflow control, ease of operation and the ultimate design, our awnings always deliver functionality with style for all outdoor living environment. Retractable awnings add functionality, protection and architectural interest to an outdoor area. At Complete Home Improvement, you’ll find unique designs and quality materials in our array of stylish retractable awnings. So give your outdoor area better protection from the climate and allow nature to shine on it with our sturdy retractable awnings. 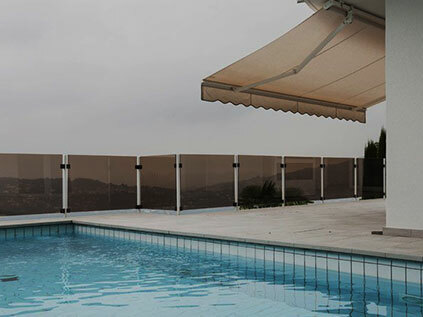 With our practical and durable retractable awnings in Sydney, you can enjoy your outdoor space in style. Fixed awnings can’t be folded and it is a permanent fixture protecting your property from sun’s heat, rain, and other weather conditions. Complete Home Improvement has an array of fixed awnings that is purposely designed keeping the Australian weather in mind. With Complete Home Improvement’s well-built and robust fixed awnings, you can create a relaxed space and get protection from the harsh heat of the sun during summers. If you’re looking for the right type of awning for your outdoor space or windows that can perfectly mingle with your home design, we can help you. Immediately, pick your phone and give us a call at Complete Home Improvement on 1300 912 293 for different home improvement requirements like Awnings, Sunrooms, Outdoor Blinds and Pergolas installation in Sydney.